The Japan / Otaku blog scene now has a new way to prank our friends online! Heavyweights in the English Japan-focused blog scene Danny, Hector, and James have teamed up to create a Rick Roll video appropriately known as the Tokyo Stormtrooper RickRollâ€™d video! Every April 1st (April fools day), it has becoming an internet trend to trick your friends into watching the Rick Astley hit video, Never Gonna Give You Up. Most people send a link to the video disguised as something else, and after you watch it, you have officially been Rick Rolled. 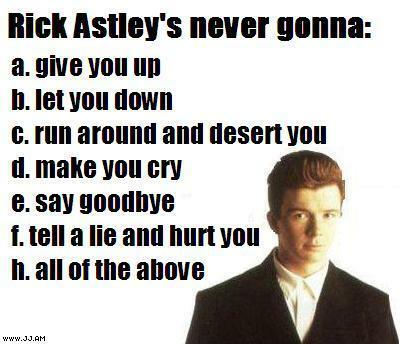 Click here for more info on Rick Rolling. So now go spread the world, and you have just been officially Tokyo Rick Rolled!